Fórsa has called for an early meeting with Stobart Air after the airline agreed to talks with the union. Fórsa says it represents up to three quarters of Stobart Air's roughly 130 directly-employed cabin crew personnel, who are based in Dublin and Cork. On Wednesday they voted in favour of industrial action in relation to trade union recognition and talks over pay and working conditions. However the potential for strike action has diminished after the airline agreed to hold talks with the union. "Our ballot result reflected the strength of feeling and determination of Stobart cabin crew, and it gave the union a clear and effective mandate to win union recognition and work for better pay and working conditions," said Fórsa official Ashley Connolly. "Union recognition is now the overwhelming norm in the Irish airline industry, and this is due to the determination of often-vulnerable workers who, with the support of their unions, have stood up for their rights at work." A spokesperson for Stobart Air said it was "pleased" with progress made between it and the union, and said it hoped to avoid industrial action "in the interest of staff, partners, passengers and our business." "As always, Stobart Air maintains an engaged and collaborative relationship with all staff on a regular basis and we remain committed to dialogue and engagement," it said. 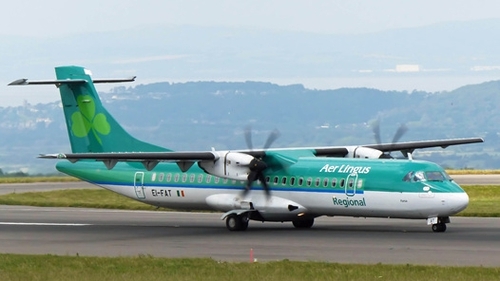 Stobart Air operates regional services on behalf of a number of airlines; including Aer Lingus, British Airways and KLM. It is headquartered in Dublin and employs more than 570 people.